From The Hollywood Reporter: Steven Soderbergh's Side Effects, a thriller starring Jude Law, Rooney Mara, Catherine Zeta-Jones and Channing Tatum and the action comedy The Necessary Death of Charlie Countryman from commercials director Fredrik Bond will compete this year for the Golden Bear at the Berlin International Film Festival. Side Effects is Soderberg's fourth film to screen in competition in Berlin -- following The Good German (2006), Solaris (2002) and Traffic (2001). The Oscar-winning director made the trip to the German capital last year with the actioner Haywire, which had an out-of-competition screening. In Side Effects Mara plays a woman who turns to prescription drugs to fight anxiety after her husband (Tatum) is released from prison. There's a couple of articles online with Steven talking about Behind the Candelebra: Steven Soderbergh: Every Studio Rejected Liberace Film as 'Too Gay' and Michael Douglas, Matt Damon, Steven Soderbergh & & Jerry Weintraub On HBO’s ‘Behind The Candelabra’. I've added a few stills and posters for Side Effects to the photo gallery. E! Online has a couple of images of Matt Damon and Michael Douglas in Behind the Candelabra; click here to see them. From ComingSoon.net: "Open Road Films has launched viral site TryAblixa.com for the drug that Jude Law prescribes Rooney Mara and Channing Tatum in Steven Soderbergh's upcoming thriller, Side Effects. The successful New York couple's world unravels when the new drug – intended to treat anxiety – has unexpected side effects." View the website here. Magic Mike is now available on Region 2 DVD from Amazon.co.uk! The Battle of Algiers has been released on DVD by The Criterion Collection and the extra features include "Interviews with Spike Lee, Mira Nair, Julian Schnabel, Steven Soderbergh, and Oliver Stone on the film’s influence, style, and importance". The DVD can be ordered at Amazon.com . The first trailer for Side Effects (aka The Bitter Pill) is online at Yahoo Movies! Magic Mike is now available on Region 1 DVD from Amazon.com ! 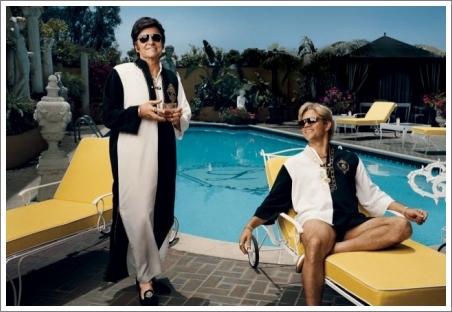 There is an image of Michael Douglas and Matt Damon in costume on the Behind the Candelabra set in the October issue of Vanity Fair. Click here to read the article online and to see a larger version of the image below. Magic Mike will be released on Region 1 DVD on the 23rd October and on Region 2 DVD on the 26th November and is available to pre-order now at Amazon.com or Amazon.co.uk . The photo gallery has been updated with more stills from Magic Mike as well as posters and production images. The trailer for Magic Mike is online at the official Magic Mike website. 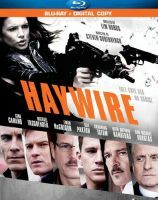 Haywire is now available on Region 1 DVD ! The extras include Gina Carano: From MMA to Haywire, The Men of Haywire, Trailers. From ItsOnTheGrid.com: Contagion 2 is officially in the works with an OWA out from Warner Bros. Scott Z. Burns, who wrote the screenplay for the original film, will be producing this time around. It is not yet known whether Steven Soderbergh will return to direct. Contagion was released on September 9th, 2011 and grossed $135 million worldwide.